Following the success of the installation of a ‘Dingham’ electromagnet for uncoupling the box van delivering spare parts to the shed stores siding as detailed in my Controlling Interests #6 post, I have now added an additional Dingham’ electromagnet for also uncoupling the ash wagon next to the workers clearing the ashpits. As with the box van I have added a short piece of iron wire fixed to the dropper of the tension lock coupling hook of the ash wagon, and installed the ‘Dingham’ electromagnet by simply self threading the 5mm core bolt of the Dingham’ electromagnet into an interference hole drilled through the ash pit into the baseboard. The head of the bolt within the ash pit itself has been covered with ash keeping it totally invisible from view. A simple push to make switch on the control panel provides the required 12v DC for the magnet to operate that pulls down the iron wire dropper that lifts the hook for uncoupling. This latest modification is ready to operated next weekend when Fisherton Sarum will be returning to its spiritual home, Salisbury, to be exhibited at the Salisbury and South Wilts Railway Societies 50th Anniversary exhibition. The exhibition is being held at the Michael Herbert Hall, South Street, Wilton and being their golden anniversary should hopefully be a special event. It is open to the public 10.30am to 4.30pm on the Saturday and 10am to 4pm on the Sunday. 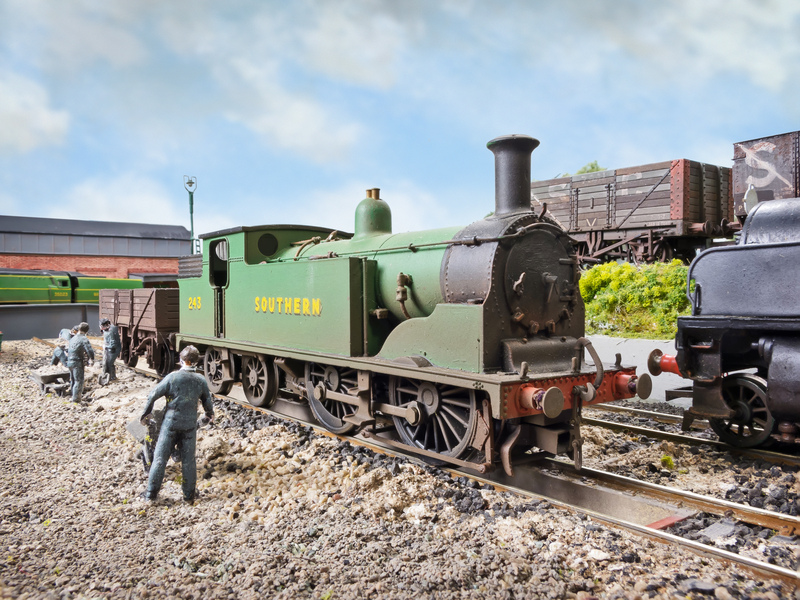 In addition to Fisherton Sarum there are 14 other layouts across a wide range of scales attending including a number that are Southern related.